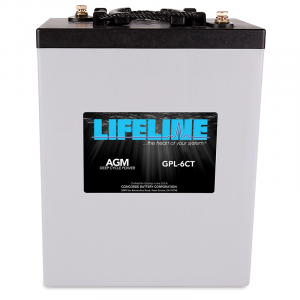 Lifeline batteries are some of the most trusted AGM deep cycle batteries on the market today. People ask us all the time how we can sell our Lifeline AGM Deep Cycle Marine & RV batteries so low, it’s because we have been selling them for over a decade! We move a lot of Lifeline batteries so all of our AGM batteries have the freshest date codes, quite possible the freshest in the country. Concord’s AGM Technology was originally developed in 1985 for military aircraft where power, weight, safety and reliability were paramount considerations. They have incorporated this technology in the LIFELINE series of maintenance-free AGM deep-cycle batteries. Many OEM Boat and RV and coach Builders trust Lifeline batteries for their reliability, durability and safety. We carry 6V, and 12V Lifeline AGM deep cycle batteries, if you need a quote on a battery we do not carry, please give us a call today!